There were 465 press releases posted in the last 24 hours and 153,730 in the last 365 days. 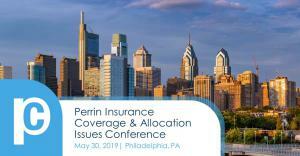 Perrin’s annual Insurance Coverage & Allocation Issues Conference to take place on May 30, 2019 at the Union League of Philadelphia. WAYNE, PENNSYLVANIA, UNITED STATES, April 2, 2019 /EINPresswire.com/ -- Perrin Conferences, the leading national provider of joint plaintiff/defense litigation conferences, will host its annual Insurance Coverage & Allocation Issues Conference on May 30, 2019 at the Union League of Philadelphia. This one-day conference will feature leading in-house counsel and insurance executives representing some of the industry’s most respected companies such as Allianz Global Corporate & Specialty; AmTrust North America; AXA XL; Berkley Environmental; Chubb; Crum & Forster; Duke Energy Corporation; Marriott International; Marsh USA; Sompo International Insurance; Westport Insurance Corporation; York Risk; and more. Speakers will share their insights on compelling litigation trends currently shaping the insurance coverage industry. Perrin Conferences applied for approximately 7.0-8.4 CLE credit hours, depending on the state. CE Adjuster Credit is pending in FL, OK, and TX. Please contact Katie Milnes at kmilnes@perrinconferences.com for any questions and to submit your CLE requests. In addition to the educational benefits, attendees also receive exclusive opportunities for networking, information sharing, and career development. For more details on registration and hotel accommodations, please contact Lynnsey Perrin at lperrin@perrinconferences.com or visit the Perrin Conferences website at www.perrinconferences.com.